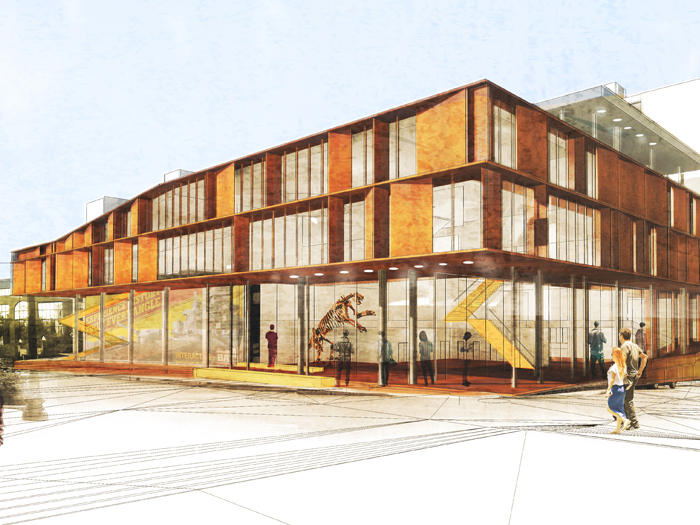 WILMINGTON — A giant ground sloth skeleton stands in a prominent space along North Third Street in a rendering from the sole proposal New Hanover County received for Project Grace, including the relocated Cape Fear Museum. Thursday, a day after county staff presented the proposal at a joint meeting with the Cape Fear Museum Advisory Board and New Hanover County Library Board, the county unveiled it to the public. The project involves four companies: Zimmer Development Company and Monteith Construction of Wilmington, as well as Little Architectural Consultants and Vines Architecture. Per the proposal, the first phase would be to build the joint New Hanover County Library and Cape Fear Museum space, along with a 125-unit apartment tower that renderings show as containing nine total stories. Once that is completed, the proposal said, the old Belk Department store containing the library’s downtown branch would be demolished, replaced with a second nine-story, 125-unit apartment tower. Jonathan Barfield, the chairman of the New Hanover County Commissioners, said he is pleased with what he saw in the proposal, but that it is simply a first attempt to put the county’s vision on paper. “We’re taking it slow to make sure we get it right,” he said, adding a pair of community information sessions in two weeks held at the cultural assets that would be affected by the projects will offer members of the public a chance to offer feedback. New Hanover County owns the whole block bordered by Chestnut, Grace, Second and Third Streets. The redevelopment would happen around the existing county parking deck, accessible from Second Street. The first residential tower that would be built would feature seven stories of apartments on top of a shared space with the library and museum facility. The second tower would have restaurant and retail spaces on the bottom levels, again capped by seven stories of apartments. “We anticipate attracting young professionals who want to live and work downtown,” the proposal states. Should the project be developed as proposed, it would include 240,000 total square feet of apartments; 74,000 square feet for commercial office space; 42,000 square feet apiece for the library and museum; and 23,700 square feet for retail space — including 8,000 square feet for restaurants. The design is based on a scenario presented last summer that would see the county pay $20.9 million and $107.2 million in private investment. Specifics of the project have been tweaked since that scenario was initially proposed, so the dollar amounts may have changed. “We are completing a financial analysis of the proposal, and then we will take all of that information — along with the public input we receive — to our Board of Commissioners this Spring to determine next steps,” County Manager Chris Coudriet said in a statement. Story Park, the park outside the library that opened in October 2016, will remain intact throughout the first two phases of the project, according to the proposal. Should the market demand it, a boutique hotel or office tower could be built in the existing area at the corners of Chestnut and North Third streets. If that third building becomes necessary, Story Park would move to an outdoor area into the library area. A second outdoor space at the top level on Third Street would be used for children’s activities, according to the proposal. Barfield said he was particularly happy with the joint library-museum complex’s proposed location at the corner of Grace and North Third streets — a place that would allow the library to remain open while construction was ongoing.